Hiccup (Jay Baruchel) and his dragon buddy, Toothless are back for yet another adventure with How To Train Your Dragon 3 (The Hidden World). Over the last two instalments, we have seen their selfless friendship have its ups and downs. Hiccup has taught his Viking brethren of Berk that dragons are not dangerous and they can cohabitate with humans. He makes a fellow Viking. Astrid (America Ferrera) fall for him, with Toothless being the Cupid of sorts. The last movie had Hiccup find out his mother Valka (Cate Blanchett) is alive while his father Stock (Gerard Butler) gets killed (by a brainwashed Toothless). Now with How To Train Your Dragon 3, things are going to be even more personal, this time for Toothless. Our boy has found luvvvvv!!! How to Train Your Dragon: The Hidden World Trailer 2 – Toothless Gets a Girlfriend in the New Animated Comedy - Watch Video. Hiccup is now the chief of Berk, where the increasing dragon population is becoming a slight hindrance. Hiccup, Astrid, and the rest of their gang, including Valka, Snotlout (Jonah Hill), Fishlegs (Christopher Mintz-Plasse), the twins Ruffnut (Kristen Wiig) and Tuffnut (Justin Rupple, replacing the disgraced TJ Miller) also rescue more dragons from the warlords, bringing more attention to Berk from enemies. The dragon warlords hire dragon hunter Grimmel The Grisley (F Murray Abraham) to capture Toothless, who now rules over the dragons in Berk, who in turn, will bring the rest of the horde with him. Grimmel, who has a particular obsession with killing Night Furies, uses the sole female Night Fury in captivity to lure him. 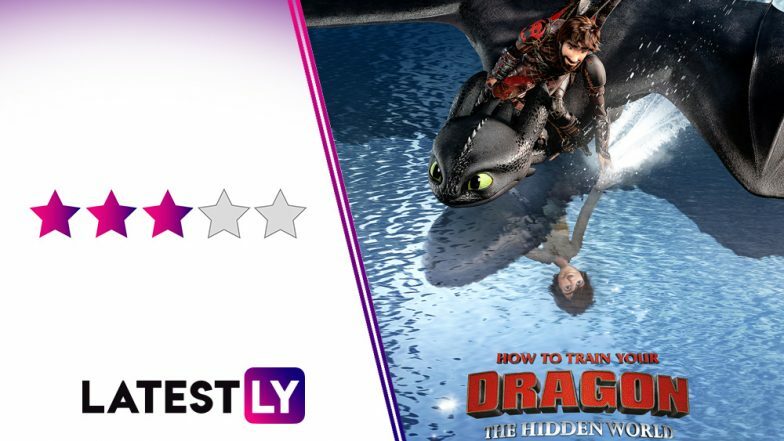 While Toothless falls for this pretty, white and snooty dragon (whom the heroes name as White Fury), Hiccup and co. must figure out how to keep their dragons and themselves safe from Grimmel. The only solution for them is for Hiccup to find out if a mythical place filled with dragons called the Hidden World exists. Like the previous two movies, How To Train Your Dragon 3, directed by Dean DeBlois, scores once again with its breathtaking visuals and magnificent background score. The animation is top-notch with some very beautiful rendering of the medieval world. Be it the sand used for drawing by Toothless to Astrid's hair flying in the breeze, everything felt so natural. The dragons' designs are once again terrific. A scene that particularly stands out is when Toothless and White Fury go for their flight date through thunderstorms and some lovely Northern lights. Another scene that mesmerises you is when Hiccup and Astrid fly through the ethereal Hidden World (though it has shades of our first sojourn through Atlantis in Aquaman). John Powell's use of symphonies for background score has its own magical effect to the proceedings. The voice-cast, as always, is excellent, led by a perfectly-cast Jay Baruchel and America Ferrera. How to Train Your Dragon: The Hidden World Trailer – Toothless Trying to Woo a Female Dragon Is One of the Best Scenes in This Animated Fantasy Drama. Plot-wise, How To Train Your Dragon 3 is no great shakes. The first film was charming, the second was emotionally powerful. The third instalment is lovely but falls just below its predecessors when it comes to its premise. The tussle between the heroes and the villains feels like an extension of the previous movie. The antagonist, Grimmel (Abraham's silky voice is a terrific choice) is a fascinating character (seemingly inspired by The Lost World's Roland Tembo), for sure. But his schemes to capture Toothless using White Fury seems very convoluted, when he has the skills to tackle the problem himself. The inter-personal conflict shown in the film also is something we have seen being explored in other recent movies too. Like, Ralph Breaks The Internet, for example. Some of the supporting characters like Snotlout, Ruffnut and Tuffnut get more moments to shine here. Snotlout trying to impress Valka, and Ruffnut's boisterous talks raise some good laughs. At the same time, other great characters from previous films like Valka and Eret (Kit Harrington) get the short shrift. The brave Astrid and the simplistic Hiccup's romance, not without some cute banter though, takes a back seat for Toothless and White Fury's love story. No complaints there, for there is nothing as delightful as a dewy-eyed Toothless trying to impress a hard-to-please White Fury and nearly making a fool of himself. But then, ultimately, How To Train Your Dragon series is about the unusual, unconditional friendship between a human and a dragon. And like the previous movies, the third part scores some good emotional points and conflicts when it comes to the friendship between Toothless and Hiccup, and ends the trilogy on a very heartfelt note (while, slyly, leaving a little window open for future movies). How To Train Your Dragon: The Hidden World may be the least resonant in the franchise. That's more because, the first two films are marginally superior than the third instalment. How To Train Your Dragon 3 is beautiful to look at, has a lovely score and boasts of a fine voice-cast continuing their good form. What's more, How To Train Your Dragon 3 ends the adventures of Hiccup and Toothless on an emotionally high note, which this wonderful franchise totally deserves.